We had planned on going to the Buddhist temple in Kent, NY today. With a weather forecast of extreme grayness we opted instead to spend the day at Rye Playland, testing out my new lens. 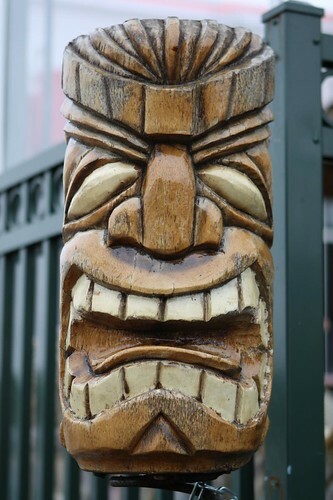 I decided the lens was quite nice after taking this picture at the Tiki Bar. Only a nice lens could manage that. 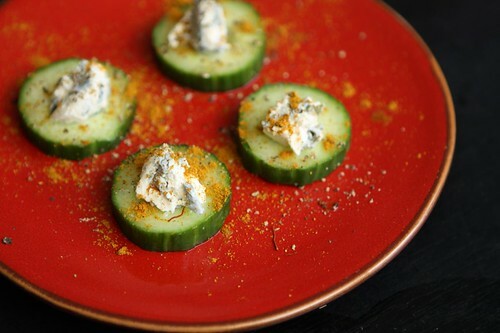 When we got home we watched the Vancouver Canucks soundly defeat the San Jose Sharks then I made an hors d'oeuvre for Jen out of cucumber rounds, St. Agur bleu and a sprinkle of curry powder. I did not have any because this contained cucumbers which are disgusting. Jen said this hors d'oeuvre was "interesting" which, as we all know, is the highest form of praise. 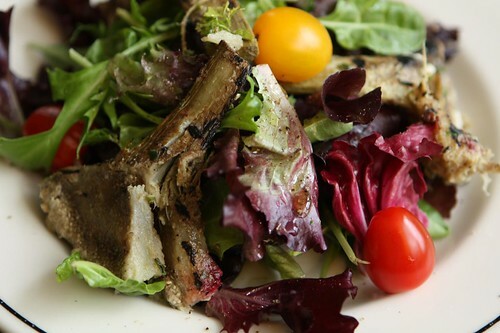 After that I used some of the leftover grilled artichokes from last night to make this salad with lemon and grape tomatoes. 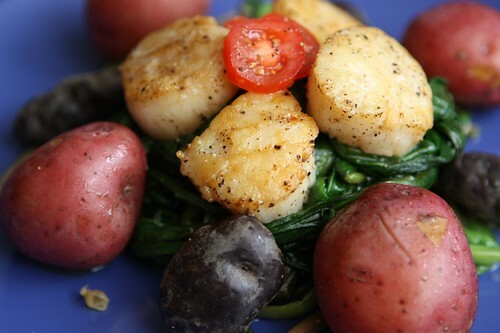 I had some nice Jersey ramps and I sauteed them quickly, serving them with some pan seared Jersey Sea Scallops and boiled buttered potatoes. This was a very Jersey-centric main course. The only thing that could have made it more Jersey is if Bon Jovi had come over to play an acoustic version of Dead or Alive for us while we were watching Young Guns II. I decided to have this Piraat Ale by Brouwerij Van Steenberge. I thought this would fit in well with the nautical theme of the day. 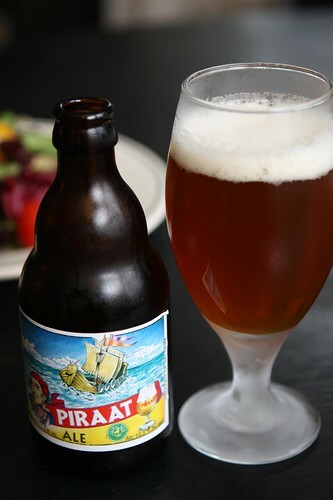 We were by the ocean, we had scallops, and then we finished it with a pirate-themed beer. Just for the record: this beer was incredible. It was very high in alcohol (10.5% ABV) but much lower in alcohol than rum so I'm pretty sure real pirates would think I was a wuss for drinking something so weak. After that Jen had the genius idea to go to Longford's for ice cream. You may want to be careful as Google has apparently marked this site as an "attack site" which seems pretty unlikely. All I know is even if my computer is now infected with spyware it's not big deal. The "Graham Slam" ice cream was definitely worth it.